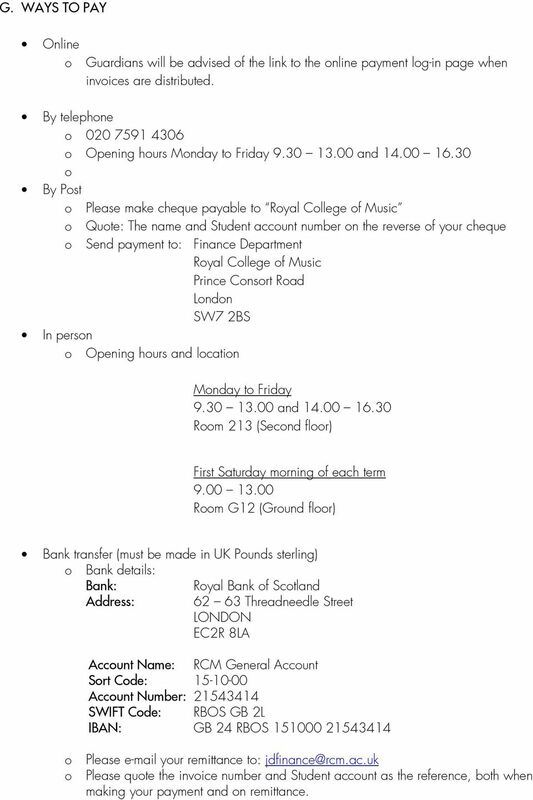 Download "Royal College of Music Junior Department"
1 Royal College of Music Junior Department PAYMENT TERMS & CONDITIONS A. Definitions B. Course fees 1. 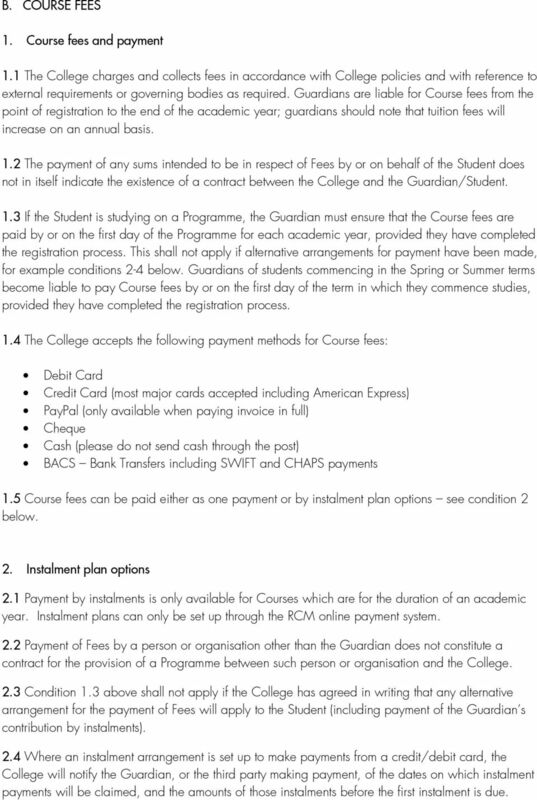 Course fees and payment 2. Instalment plan options 3. External funding 4. Bursaries and Scholarships 5. Failure to pay fees 6. Refund of fees C. Other fees and payments D. Currency conversion costs, bank charges etc. 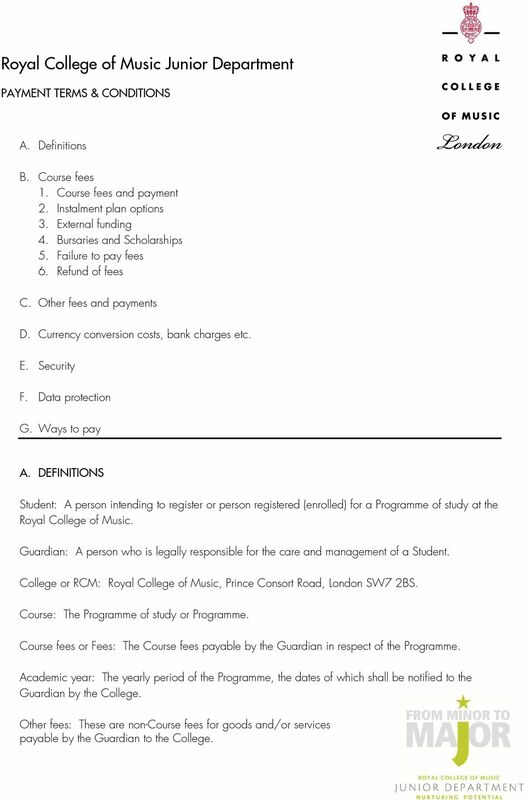 E. Security F. Data protection G. Ways to pay A. DEFINITIONS Student: A person intending to register or person registered (enrolled) for a Programme of study at the Royal College of Music. Guardian: A person who is legally responsible for the care and management of a Student. College or RCM: Royal College of Music, Prince Consort Road, London SW7 2BS. Course: The Programme of study or Programme. Course fees or Fees: The Course fees payable by the Guardian in respect of the Programme. Academic year: The yearly period of the Programme, the dates of which shall be notified to the Guardian by the College. 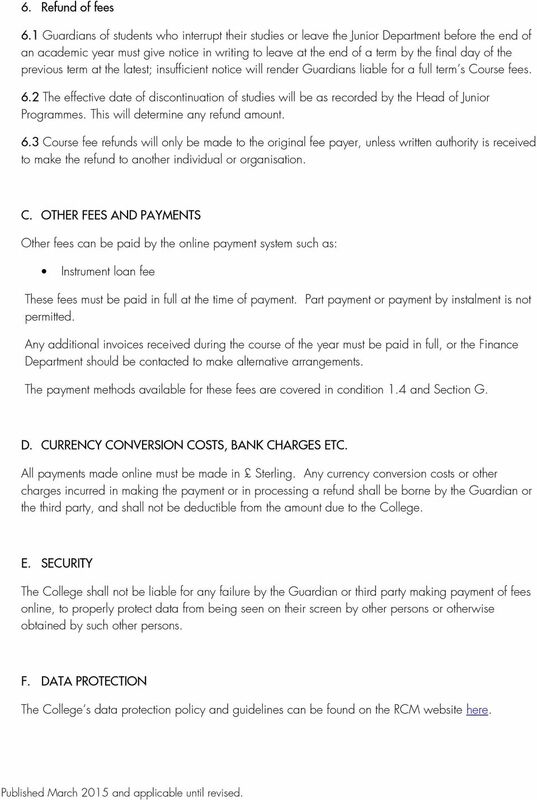 Other fees: These are non-course fees for goods and/or services payable by the Guardian to the College. 2 B. COURSE FEES 1. Course fees and payment 1.1 The College charges and collects fees in accordance with College policies and with reference to external requirements or governing bodies as required. Guardians are liable for Course fees from the point of registration to the end of the academic year; guardians should note that tuition fees will increase on an annual basis. 1.2 The payment of any sums intended to be in respect of Fees by or on behalf of the Student does not in itself indicate the existence of a contract between the College and the Guardian/Student. 1.3 If the Student is studying on a Programme, the Guardian must ensure that the Course fees are paid by or on the first day of the Programme for each academic year, provided they have completed the registration process. This shall not apply if alternative arrangements for payment have been made, for example conditions 2-4 below. Guardians of students commencing in the Spring or Summer terms become liable to pay Course fees by or on the first day of the term in which they commence studies, provided they have completed the registration process. 1.4 The College accepts the following payment methods for Course fees: Debit Card Credit Card (most major cards accepted including American Express) PayPal (only available when paying invoice in full) Cheque Cash (please do not send cash through the post) BACS Bank Transfers including SWIFT and CHAPS payments 1.5 Course fees can be paid either as one payment or by instalment plan options see condition 2 below. 2. Instalment plan options 2.1 Payment by instalments is only available for Courses which are for the duration of an academic year. Instalment plans can only be set up through the RCM online payment system. 2.2 Payment of Fees by a person or organisation other than the Guardian does not constitute a contract for the provision of a Programme between such person or organisation and the College. 2.3 Condition 1.3 above shall not apply if the College has agreed in writing that any alternative arrangement for the payment of Fees will apply to the Student (including payment of the Guardian s contribution by instalments). 2.4 Where an instalment arrangement is set up to make payments from a credit/debit card, the College will notify the Guardian, or the third party making payment, of the dates on which instalment payments will be claimed, and the amounts of those instalments before the first instalment is due. 3 2.5 The College reserves the right to make unavailable the instalment plan option if there is an unsatisfactory credit history. 3. External funding 3.1 The Guardian is required to ensure that appropriate evidence of external funding is provided prior to or on registration; the Guardian will be personally liable for any fees until the appropriate evidence of sponsorship is provided or if the Student s sponsor defaults on payment. 3.2 Payment of Fees by a person or organisation other than the Guardian does not constitute a contract for the provision of a Programme between such person or organisation and the College. 3.3 In the event that an overpayment is made against the total annual Course fee amount, the credit balance arising will be used to offset any debt or invoice on the Student s account in due date order. 4. 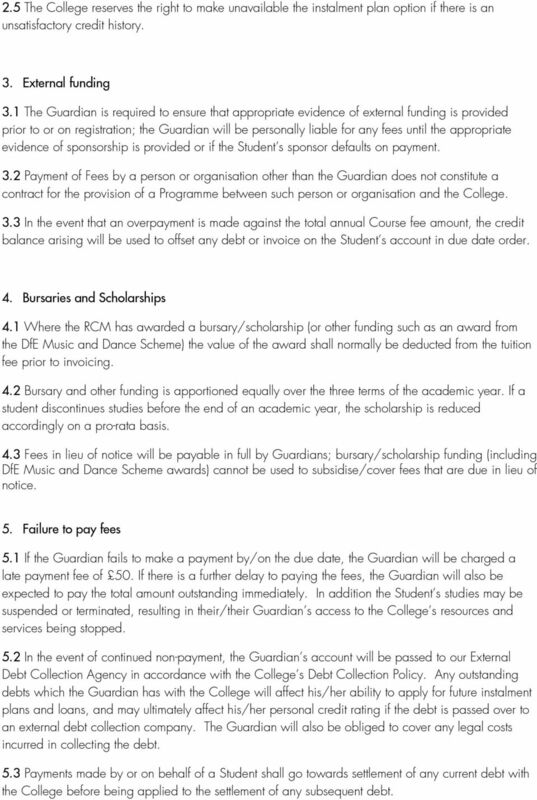 Bursaries and Scholarships 4.1 Where the RCM has awarded a bursary/scholarship (or other funding such as an award from the DfE Music and Dance Scheme) the value of the award shall normally be deducted from the tuition fee prior to invoicing. 4.2 Bursary and other funding is apportioned equally over the three terms of the academic year. If a student discontinues studies before the end of an academic year, the scholarship is reduced accordingly on a pro-rata basis. 4.3 Fees in lieu of notice will be payable in full by Guardians; bursary/scholarship funding (including DfE Music and Dance Scheme awards) cannot be used to subsidise/cover fees that are due in lieu of notice. 5. Failure to pay fees 5.1 If the Guardian fails to make a payment by/on the due date, the Guardian will be charged a late payment fee of 50. If there is a further delay to paying the fees, the Guardian will also be expected to pay the total amount outstanding immediately. In addition the Student s studies may be suspended or terminated, resulting in their/their Guardian s access to the College s resources and services being stopped. 5.2 In the event of continued non-payment, the Guardian s account will be passed to our External Debt Collection Agency in accordance with the College s Debt Collection Policy. Any outstanding debts which the Guardian has with the College will affect his/her ability to apply for future instalment plans and loans, and may ultimately affect his/her personal credit rating if the debt is passed over to an external debt collection company. The Guardian will also be obliged to cover any legal costs incurred in collecting the debt. 5.3 Payments made by or on behalf of a Student shall go towards settlement of any current debt with the College before being applied to the settlement of any subsequent debt. 4 6. Refund of fees 6.1 Guardians of students who interrupt their studies or leave the Junior Department before the end of an academic year must give notice in writing to leave at the end of a term by the final day of the previous term at the latest; insufficient notice will render Guardians liable for a full term s Course fees. 6.2 The effective date of discontinuation of studies will be as recorded by the Head of Junior Programmes. This will determine any refund amount. 6.3 Course fee refunds will only be made to the original fee payer, unless written authority is received to make the refund to another individual or organisation. C. OTHER FEES AND PAYMENTS Other fees can be paid by the online payment system such as: Instrument loan fee These fees must be paid in full at the time of payment. Part payment or payment by instalment is not permitted. Any additional invoices received during the course of the year must be paid in full, or the Finance Department should be contacted to make alternative arrangements. The payment methods available for these fees are covered in condition 1.4 and Section G. D. CURRENCY CONVERSION COSTS, BANK CHARGES ETC. All payments made online must be made in Sterling. Any currency conversion costs or other charges incurred in making the payment or in processing a refund shall be borne by the Guardian or the third party, and shall not be deductible from the amount due to the College. E. SECURITY The College shall not be liable for any failure by the Guardian or third party making payment of fees online, to properly protect data from being seen on their screen by other persons or otherwise obtained by such other persons. F. DATA PROTECTION The College s data protection policy and guidelines can be found on the RCM website here. Published March 2015 and applicable until revised. 5 G. WAYS TO PAY Online o Guardians will be advised of the link to the online payment log-in page when invoices are distributed. By telephone o o Opening hours Monday to Friday and o By Post o Please make cheque payable to Royal College of Music o Quote: The name and Student account number on the reverse of your cheque o Send payment to: Finance Department Royal College of Music Prince Consort Road London SW7 2BS In person o Opening hours and location Monday to Friday and Room 213 (Second floor) First Saturday morning of each term Room G12 (Ground floor) Bank transfer (must be made in UK Pounds sterling) o Bank details: Bank: Royal Bank of Scotland Address: Threadneedle Street LONDON EC2R 8LA Account Name: RCM General Account Sort Code: Account Number: SWIFT Code: RBOS GB 2L IBAN: GB 24 RBOS o Please your remittance to: o Please quote the invoice number and Student account as the reference, both when making your payment and on remittance. Where you see this symbol you need to be aware of the important information in the section you are completing and should review it in full. 20+ Childcare Support 2015/2016 Registration Form This childcare registration form must be completed by both the student and childcare provider before an application can be made for childcare support. Guidance Notes. How to enrol at the school If you have any questions, please contact us, we re happy to help. Please contact: Admissions@lse.uk. Online Fixed Energy A Guaranteed Deal Online Fixed Price Energy August 2014 Offer Prices effective from 20th March 2013 Limited Offer subject to availability and may be withdrawn from sale at any time.